What follows are the misconceptions I’ve encountered that have cost some colleagues dearly. I know CEOs, CMOs and Product VPs who’ve shied away from the idea of a Minimally Viable Product for fear they must sacrifice quality. There is a misconception that Minimum Viable Product means un-polished, unfinished or generally half-assed. I’d like to clear this up. Too many focus on “Minimal”. Its “Viable” that’s the most essential in this pithy acronym. Sexism disclaimer: The people I’m about to talk about are real, and are all men (white ones). That’s simply a byproduct of the severely lopsided industry demographics. 2) That can be fixed. When you’re making anything of a certain complexity, there is a huge risk just getting it built on time within the budget you have. In fact, I’ve yet to see this ever done in my 20 yrs in the industry. Here’s what happened to Jay, the CEO. He had strong funding connections, industry cred, and a killer idea. He was sure the market wanted his product. He had a strong design esthetic and ‘quality is king’ perspective. 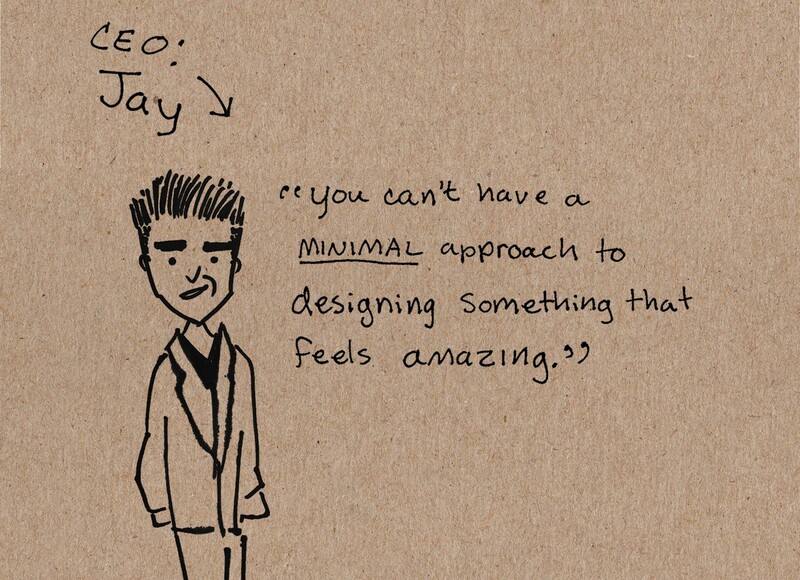 Jay’s company built something slick, albeit incomplete, for pitching his investors. Jay closed funding to get something to the market. That ‘something’ was too big of a job for the cash on hand, so the scope was limited for him when money and time ran out. Jay put more pressure on the development team and they began leaving. He bit off more than could be delivered. Despite a nice PR splash and good write-ups, his product is now languishing because it’s weird and hard to use. 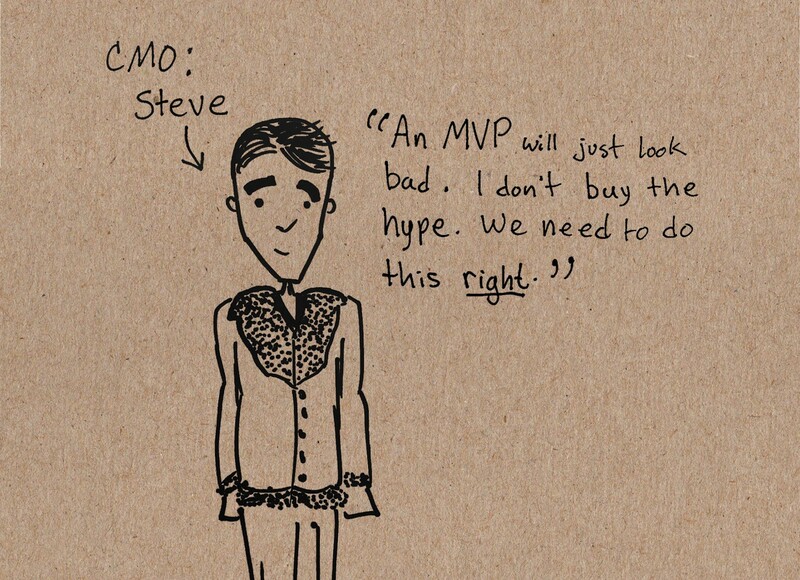 Our CMO, Steve, was looking for product market fit. His risk was much lower. As a seasoned marketer, Steve was doing a dry test. He measured reactions to a value proposition, which is great. But he’s not learning what the right solution is. Or what it will take to make it real. 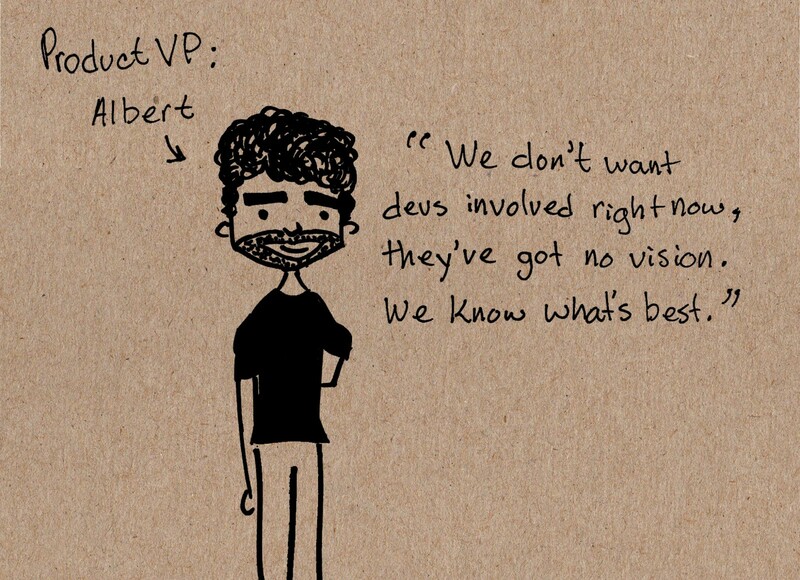 Albert, the Product VP, was at enormous risk. He invested in building out a solution to a problem he did not validate. The release date was delayed for reasons most build product releases are delayed. The devil’s in the details, and scope increases as you learn what’s really involved. When the product was released, it was less than anyone had hoped for and was out in the wild for a few months only. The investors lost faith in the company soon after. Minimum Viability is a way to get something small into the market to measure so the team may learn before more time and money is invested. 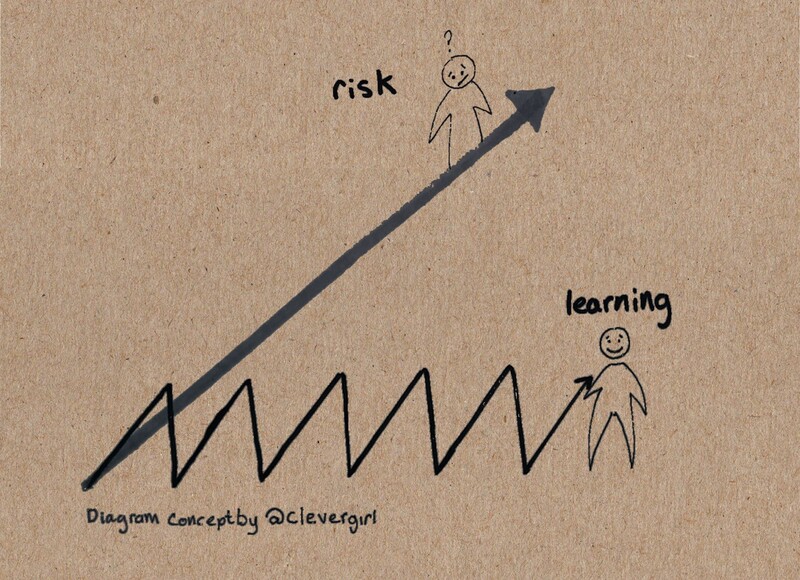 It is a way to build smartly (and beautifully), and de-risk as you move forward. 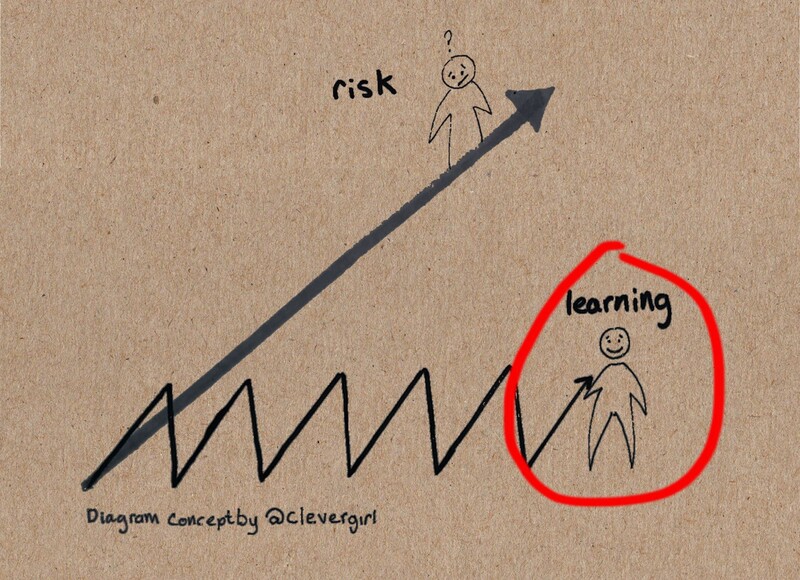 Risk accumulates over time. Real world feedback is the mechanism to re-set this risk accumulation. That is why this is considered a best practice. Risk accumulates over time. Real world feedback is the mechanism to re-set this risk accumulation. Valuable: Is this something people want? Are you solving a real problem? Usable: Can customers reach their goal? Does it feel lovely? Feasible: Can this be created with the time and money available? You may not skimp on any of these. This means you need to nail what you bite off in all three categories to the best of your ability. But nail them for something small. Demonstrate each of these with real customers, before you build much at all. Having something that technically works but feels off-brand is not viable. Having something crazy valuable that feels amazing is not viable if it can’t be build on time and on budget. Right off the bat, you need to demonstrate Value (or lack of it). This can be done quickly and easily without touching your brand (See Giff Constable’s http://www.talkingtohumans.com/). Once you’ve demonstrated that your idea has value to others, ask yourself, “What is the smallest possible thing I could make?” You should be focused on reducing risk without compromising your brand values and your tenets. 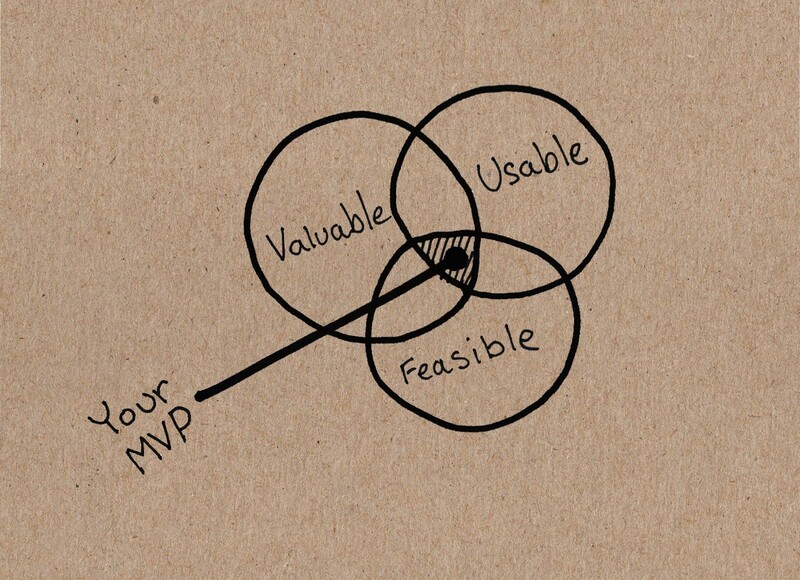 This is where Usable and Feasible come together. You must demonstrate both early. Doing so requires working transparently in balanced, multi-disciplinary teams. Designers need feasibility input from developers. Developers need to understand the constraints. Both need mind share on the desired outcomes from the product owner. To de-risk as you move forward, you need to understand what outcomes you are looking for (See Dave McClure’s Startup Metrics for Pirates). Craft experiments so you may learn as quickly as possible how your product fairs in this lens. Now you are free to go make that small thing awesomely, and measure its use. And then build more. Dave McClure: Startup Metrics for Pirates: AARRR! More about Andi: Andi has been working with fortune brands and visionary startups since the mid 1990's. In 2000 she co-founded a digital agency in San Francisco. It was in that 11-year role as chief creative where she realized small, interdisciplinary teams are able to create superior products in a fraction of the time. She continues that vision at Neo as a Lead Product Designer. Growing innovation in the enterprise. Mentoring startups (especially big, global challenges). FutureTight is an innovation consultancy based in San Francisco, California. Companies that work with FutureTight are mid-sized to large organizations foreseeing disruption and seeking new growth areas.